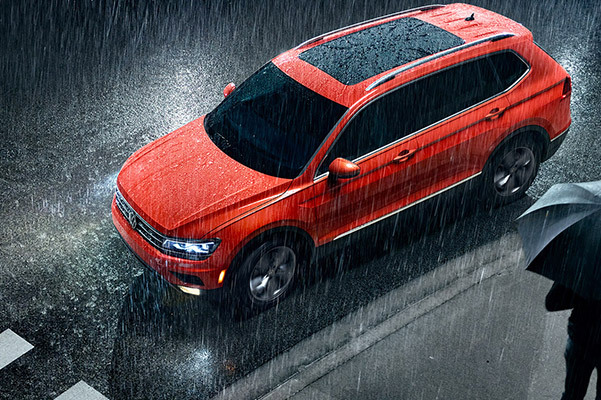 Click here to see our TIGUAN SPECIALS! A crossover is a light-duty vehicle that boasts the best benefits of driving a car, but with improved capability and a higher ride height. The Tiguan has 95.4 cubic feet of passenger space, and 23.8 cubic feet off cargo space. The body style offers more versatility with 40/20/40-split fold-flat rear seats. Many family-oriented vehicles are stocked with compact car engines. Not so in the Tiguan, which has a 2.0-liter 4-cylinder engine for a 200 horsepower and 207 pound-feet of torque output. Paired with this is a six-speed automatic transmission with Tiptronic, Sport and Dynamic Shift Program modes. There are four trims levels for the 2019 Volkswagen Tiguan, providing a wide-range of optional premium features. Standard features found in the base S trim include heated side mirrors, VW-Car-Net App-Connect, Bluetooth with audio, a rearview camera system and keyless access with push-button start. Whether you choose the 2019 Volkswagen Tiguan or a Tiguan R-Line model, you'll find we have the Tiguan you've been dreaming of at our Rockaway, NJ VW dealership. Visit us today to explore the Tiguan models for sale and to learn about current Volkswagen Tiguan specials.